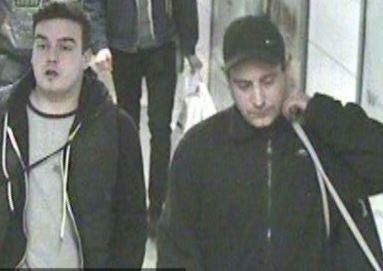 British Transport Police officers have released CCTV images of two men they wish to speak to following an assault in Oxford Circus London Underground station. The incident happened on the stairwell leading towards the Central line platforms one and two on 18, December 2015, between 2.50pm and 3pm. Oxford Circus – Do you know these men? The victim, a 17-year-old boy, and a friend were travelling through Oxford Circus London Underground station. A man, who was behind the victim, started to use abusive language towards the victim. This man was in the company of another male , both the victim and his friend chose to ignore the verbal abuse. The victim stood to look at the tube map when one of the men barged into him. The two men then began to act aggressively towards him and his friend. The victim was subsequently attacked by both men. Anyone with any information should contact British Transport Police on 0800 40 50 40 or text 61016 quoting crime B5 of 19/01/16.